The current 25-year credit cycle has seen Australian household leverage rates move to record levels versus all other developed markets. This degree of leverage is unprecedented in Australian history and is often a precursor to a major housing correction. 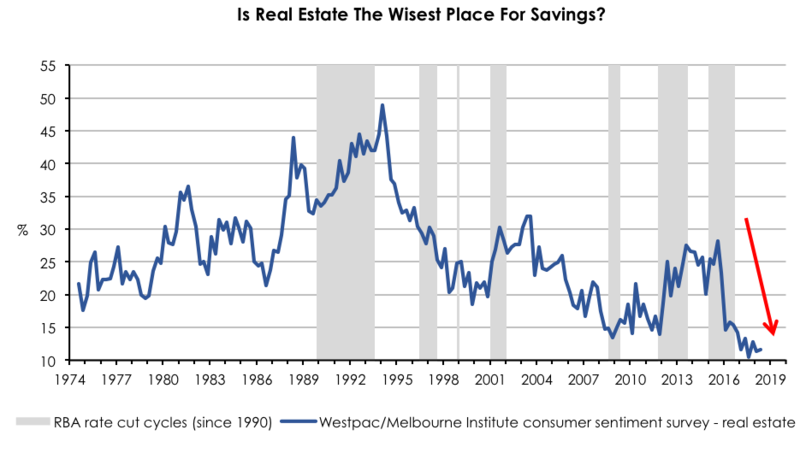 We have had significant concerns about the sustainability of the credit-driven boom of the Australian residential market, which we set out in a report published on Livewire in 2016. High leverage is not enough to cause a housing correction. It also requires credit growth to flatten out and turn negative, and we think we are seeing the early signs of this. 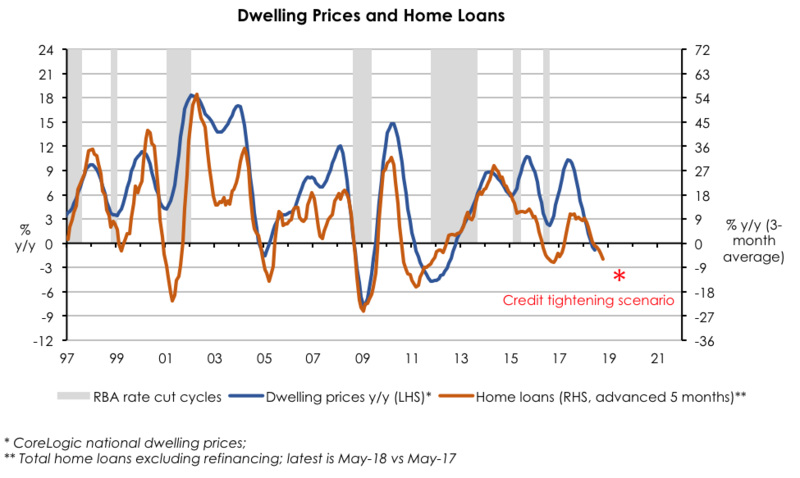 Our negative view is coming from our current observations of tightening credit conditions in Australia, coupled with a moderation in buyer demand as house prices have started to soften. Our view is future credit growth will continue to slow because banks have tightened lending standards in response to the recent Royal Commission. Very simply, it is more difficult for borrowers to get a loan. Here are five reasons we expect credit growth to keep slowing. Banks will start to use more realistic expense standards in assessing new loans – they have not been doing this previously. The average household spends around $75k per annum, but banks have been using $32-35k for over 75% of borrowers. Once banks adjust to factor in higher living expenses, they will not be able to lend as much. We estimate a drop in borrowing capacity of 10-20%, with a risk of larger declines if banks start to verify actual household expenses for a large portion of borrowers. The bank regulator, APRA, has directed banks to implement limits on the proportion of new lending at “very high debt-to-income” (DTI) levels of greater than six times (>6x). While APRA indicated it will allow the banks to set these limits based on their own risk assessment and judgement, APRA’s description of >6x DTI as “very high” suggests APRA is over time targeting a material reduction in the proportion of new lending at high debt-to-income levels. The Household Income and Labour Dynamics in Australia (HILDA) survey suggests that a staggering 1/3 of loans (by $ value) have been made at a level that exceeds six times income. If APRA’s debt-to-income directive was to reduce new loans with >6x DTI to 10-15% of new lending, this would represent a material reduction in credit availability. This is particularly so when it is considered that the two largest housing markets trade at a median house price to income of nine times in Sydney and eight times in Melbourne. This means theoretically there is little debt capacity to purchase the circa $1 million median house price in Sydney or Melbourne for households on the average income. Banks have not necessarily included all liabilities of households when determining their ability to service debt, as banks have been reliant on borrowers to disclose their pre‑existing debt levels. Comprehensive credit reporting is now being introduced that will see banks gain access to loan applicants’ pre-existing debt profiles across all Australian banks, and thus will no longer need to rely on borrower disclosure. This means banks will soon be able to take into consideration applicants’ pre-existing debt levels for all new loan applications. It is difficult to estimate the negative borrowing capacity impact. Interest-only loans reached close to 40% of banks’ total mortgage balances, which is now in decline after APRA’s 30% cap on interest-only loans (as a % of flow) since the September quarter 2017. The 30% interest-only cap means a significant number of interest-only loans will be forced to convert to principal & interest (P&I) once interest-only periods mature (typically 5‑years). Interest-only loans converted to P&I see monthly loan repayments increase by 30‑50%. Foreign, and mostly Chinese demand has represented at least 20% of new housing purchases, and it is not known what percentage of established housing. It is becoming increasingly difficult to get capital out of China after recent authority crackdowns. Australia has also made it harder, by increasing stamp duty on foreign buyers and bank lending restrictions for applicants residing outside of Australia. In addition to tightening credit standards, sentiment towards residential real estate indicates that borrowers are also less willing to enter the market. It is most likely that borrowers will do anything to keep their property and will cut spending on most categories ahead of not meeting loan repayments. We assess the impact from tighter credit conditions are yet to be felt. The first impacts will be felt amongst construction companies, residential developers and retailers. In anticipation of a slowing credit cycle, we are short a select basket of exposed companies across these sectors. The banks will likely feel the hit later as broader consumer and employment shocks kick-start the impairment cycle. That won't stop them from de-rating in the interim on slowing revenue growth, rising costs and increasing regulatory risk. Tighten the housing market and watch the rent increases occur. With population growth of 1m every 4-5yrs they need somewhere to live. Bill's proposed neg gearing ban will cause an even tighter market. The use of "average" in this article implies that the people with the attitude to succeed are average - not true! The talking heads have talked themselves into a corner because they don't want to be off-song. When the RC is out of the way then you will see a major shift in the way banks operate and loans are made - more done via brokers and most likely longer term loans as per overseas. A little bit of pain here and there (as always happens) will be absorbed because people will hold onto their homes until the bitter end. The only way to lower home prices is for population pressure to ease - and that requires the thickwit governments to move departments out into the regional cities. Stop looking down at your feet and cast your eye up to the horizon which is where all of the solutions are. The herd decided that the best way to wealth was to accumulate a portfolio of investment properties, taking on massive debt in anticipation of capital appreciation - and so it was for a while. Now the tide has turned and these properties will have to be put on the market. Where will the herd turn next? Maybe equities. thank you to tim hannon and to jack upton for your enlightening commentary...greatly appreciated.